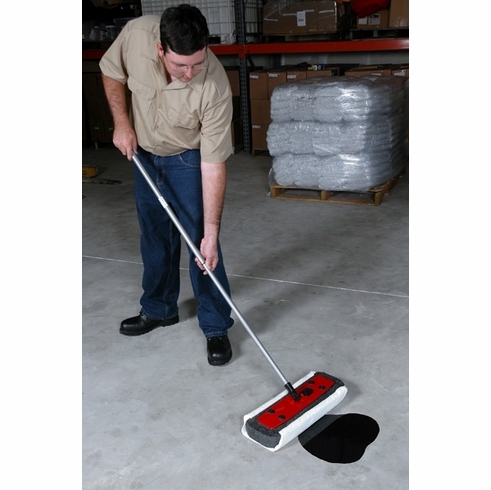 (3307): Ultra-Fuel Mop Drip Tray (Used to drain and store Fuel Mop when not in use) Each for $22.00. (3300): Ultra-Fuel Mop (includes six  Sorbent Pads). Each for $135.00. •Fast-wicking pads are designed to soak up 25 times their weight in oil and other petroleum products, but will not soak up water. •Polypropylene ”oil only” sorbent pads are cut to fit — easily removed and replaced after they have been saturated. •Foam core allows mop head to float on top of the water and pull off oil, gas and hydrocarbon sheen that floats on the surface of the water. •Floating design and pivoting handle make water surface clean-up easy with no stray oil pads to retrieve. •Aluminum handle telescopes from 30” to 52” — provides easy reach to spills. •Helps comply with the requirements of the Clean Marina Program when used as a Best Management Practice in Stormwater Pollution Prevention Plans (SWPPP).